^HWhen constructing the suspension traverse from top to bottom, a suitable hightension anchor system will be placed around the top anchor point. OfiThe rope will be deployed and the construction/mule team will rappel down in order to construct the bottom anchor. ^HSelect a sound bottom anchor point and construct a suitable high-tension anchor system. ^^The rope is pulled to the bottom anchor and clipped through the anchor system's 85. 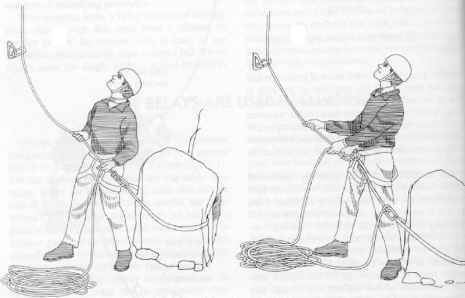 ^IWith an 18" Prusik Cord, tie a French Prusik to the rope and secure it also to the anchor system's 85. This will serve as the brake. ^^On the rope running from the far anchor point, tie a friction knot and attach an 85 through its loops. Clip the running end of the rope to the 85. ^PJAttach a second 85 into the anchor system and clip the running end of the rope into it. ^HWhere the rope comes out from the friction knot's 85, tie a second friction knot complete with an 85 and clip the running end of the rope through it. OfiYou have now made a 9:1 mechanical advantage system, with a brake attached. NOTE: If pulleys are available, place them in the 85 carabiner on the friction knot. ^^Initially the traverse is tensioned by one man. This is accomplished by pulling on the 9:1, the French Prusik is used to hold the tensioned line when the friction knots are moved. ¡¡When the installation has been tensioned as much as possible, it is secured by taking the standing end around the anchor point and pulling a large bight through the anchor system's 85. ^^Still maintaining tension on the installation, tie the bight off with a round turn and two half hitches. SAFETY NOTE: NO MORE THAN TWO MEN WILL TENSION THE INSTALLATION AT ANY TIME IF USING PULLEYS. NOTE: When two ropes are used, care should be taken to anchor the lines as close together as possible, in such a manner that the ropes do not cross each other. JgWhen constructing a suspension traverse from bottom to top, the lead climber will attach the traverse's ropes to the back of his harness. ^^Once the lead climber reaches the top safely, the traverse's ropes will be anchored off using a suitable high-tension anchor system. The lead climber will then bring up the number 2 climber. ^^The installation is constructed and tightened from the bottom. TRANSITION: Now that we have discussed the construction, are there any questions? If you have to gain height at the top and there is no suitable tree, branch, or rock to place the static line across then you will have to construct and use an A-frame (see A-Frame outline).